Construction demolition equipment from Gregory Poole can help you convert materials to reusable sources. Our equipment supports markets such as renovation, construction, forestry, waste management and many others by working with resources like wood, plastics, textiles, concrete, glass, metal and drywall. When you need the right pieces of equipment to skyrocket productivity levels and increase uptime, Gregory Poole Equipment Company has an entire stock of Cat® machines at your service. Caterpillar® offers machines and work tool solutions that provide powerful performance and rugged reliability for a wide variety of industrial applications. 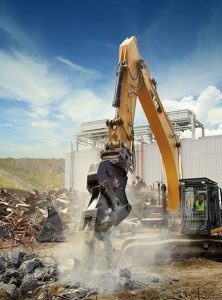 From demolition and site preparation to scrap recycling and material handling, we have developed machine and work tool solutions for every stage of the process – machines and work tools designed with the versatility to meet the most challenging site demands and the durability to keep your work crews productive all day every day. From machines to tools, service to support, you’ll get only the most powerful and productive work site solutions from Caterpillar and Gregory Poole. Demolishing existing structures and preparing sites for future projects is tough work. It requires the right equipment to get the job done efficiently and profitably – equipment like our Cat® 330C L UHD and 345B L Series II Ultra-high Demolition Excavators. They are purpose built to maximize stability and performance – and have long reaches: 68′ 11″ (21 m) high on the 330C L UHD, and 83′ 8″ (25.5 m) on the 345B L Series II. Cat offers solutions for stripping, cutting, crushing and pulverizing. From razing and scrap separation to loading and site finishing, Caterpillar offers the right machines and work tools for every step of the process. They’re all designed and built with the quality Caterpillar is known for – so you get the most from your equipment investment. We can help you assemble a team of reliable, versatile, and economical demolition machines and work tools that deliver dominant powerful performance and rugged reliability for a variety of demolition applications. We offer different kinds of products for the scrap and demolition industry to fit your needs during any step of the process. Before investing in our solutions, you need to make sure you understand the task at hand and what materials you’ll be working with. After you have a solid idea, select any work tools if necessary. The most vital decision is to determine the right machine for your specific tasks. Gregory Poole offers a range of machines to support your dedication to safety and efficiency. We deliver high-reach machines to make large jobs possible, and we have demolition excavators for sale. Anything from shears, hammers and multi-processors to tractors, loaders and trucks for cleanup, we strive to help you remain a sustainable business. We ensure high efficiency, machine versatility, worksite safety and low operating costs. We also provide machines that have the power to lower costs per ton of material. Our experts are here to support you in finding the right machine for your project with equipment that has improved visibility, operator protection and technology-equipped engines that allow you to gain more insight. View our scrap material handlers for sale, such as our wheel loaders, skid steers and material handlers as well as our excavators and articulated trucks. Gregory Poole offers financing options, and our professionals uphold strong technical experience to support you even after the point of purchase. Search through our construction and demolition equipment to find which solution best suits your projects. If you need further assistance, fill out our online contact form or call a rep at (800) 451-7278.